If you are lucky enough to visit Amsterdam in springtime, a trip to Keukenhof in Lisse to see the stunning tulips and flowers is a must! 7 million bulbs are planted each year over 32 hectares for visitors to discover and explore. The gardens are the most famous in the world and host the most amazing flower displays and shows. Be warned though, they only open 8 weeks of the year from 22nd of March to the 13th of May! A visit to this charming, picturesque village is a great day out to see the beautiful, traditional windmills. You can take in the scenery by a boat along the canal which makes any trip to Zaanse Schans even more special. It only takes 15 minutes by train to get from Amsterdam from Amsterdam Central Station. This is an unforgettable, fun day out especially for cheese lovers! Alkmaar is a lovely, traditional village just 30 minutes from Amsterdam by train. It hosts the most famous cheese market in the world where you can enjoy the old, local style of buying and selling cheese along with many shops, cafes, and gift shops to visit. The market opens every Friday from March to September and is a lovely way to spend the morning! Utrecht is similar to Amsterdam but with far fewer tourists and a lot more canals. The best way to explore this city is by boat, gondola or water bike. You can choose to explore the canal district or the outer green areas which lead to the woods and estates of Amelisweerd. There are many places to stop for a picnic and also many restaurants/cafes around the city to have lunch. Utrecht is about 30 minutes on the train from Amsterdam. Just a short train journey away, Rotterdam is the perfect day trip from Amsterdam. This a large, modern city with so much to do and see. One of our favourite things to do here is to check out the highest point in the Netherlands, the Euromast. You can get the elevator 185 meters up and enjoy the spectacular view. You can also enjoy other stunning architecture while in Rotterdam such as the Markthal. 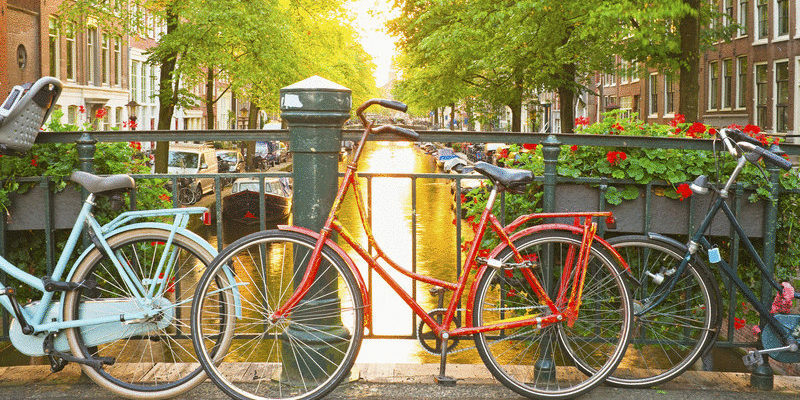 Tempted to visit Amsterdam and it’s beautiful surroundings?